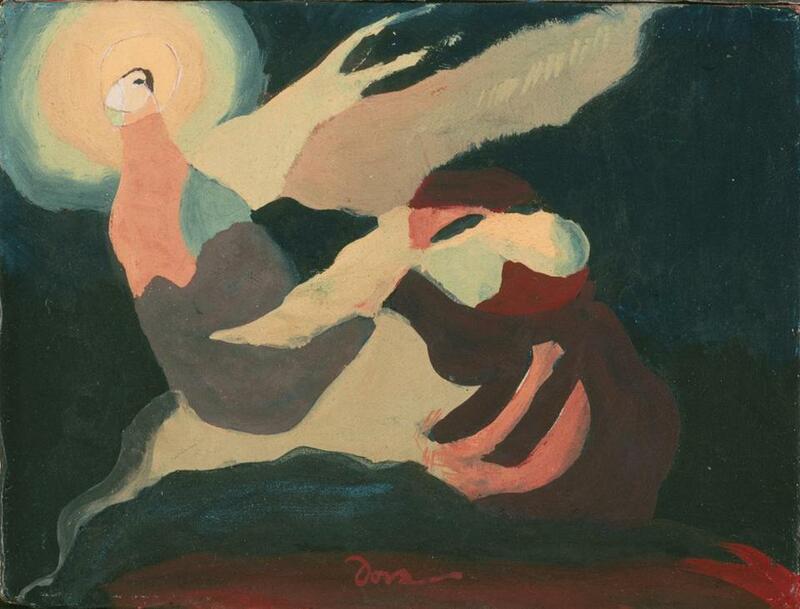 Arthur Dove’s “The Moon Was Laughing at Me” from 1937. BRUNSWICK, Maine — Our eyes have two kinds of light-receptive cells: rods and cones. The cones work best in daylight. They’re sharp, they pick up on the many slippery wonders of color. But they don’t work in the dark. That’s when the rods kick in. Rod cells are remarkably efficient in low-light conditions. But they take about two hours to reach maximum efficacy, and they don’t detect color. It’s hard to judge distance and volume by tones of gray alone, and this slight enfeeblement can make the mind more alert in the dark. It heightens the whole body’s senses. “Night Vision: Nocturnes in American Art, 1860-1960,” a major exhibition at Bowdoin College Museum of Art in Maine, has nothing much to say on the mechanics of vision. But it does investigate the implications — psychological, emotional, spiritual, social, aesthetic — of night vision in American art, in a period that saw artificial lighting rapidly encroach upon the human experience of night. Something about the theme seems obvious. The very word “nocturne” — wrested by Whistler from Chopin in the 1860s — describes a familiar groove, if not a rut, in the history of early modernist aesthetics. But “Night Vision” expands its inquiry well beyond Whistler, and our pupils dilate in response. Thanks to ambitious loans and smart selections by the show’s curator, Joachim Homann, it enriches ideas about native qualities — both realistic and visionary — in American art. Every work in the show amplifies the heart’s ambivalence about night. That ambivalence became widespread in the wake of electrification, which allowed nighttime illumination, especially in cities, as never before. In the works of Whistler and his American brethren, night became almost synonymous with nostalgia — with a longing for a spiritual sanctuary from relentless illumination, and from all the pitfalls of industrialization. 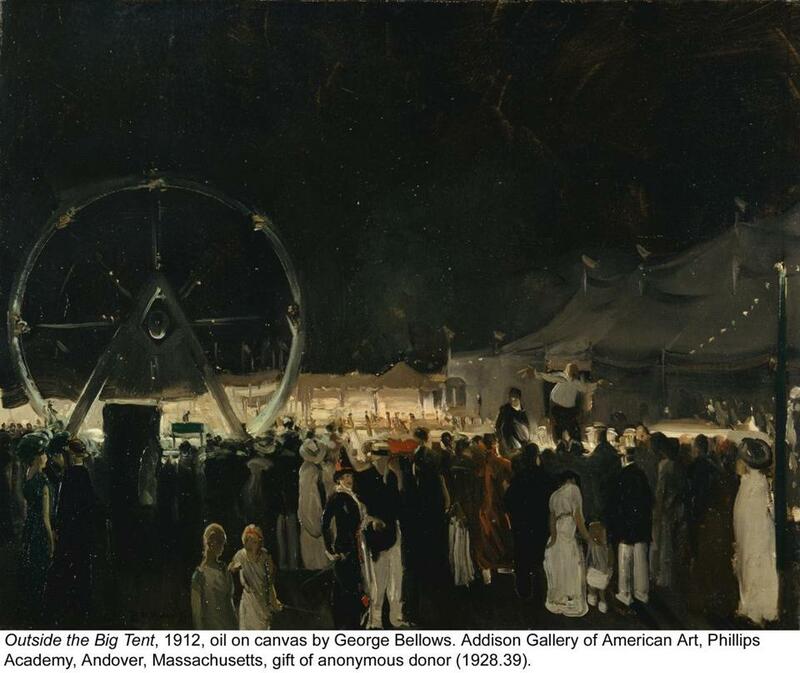 George Bellows’s “Outside the Big Tent” from 1912. One of those brethren, George Inness, was a follower of the Swedish mystic Emanuel Swedenborg. Inness came to see the moon as an emblem of faith. He is represented here with an early landscape, “Winter Evening,” on loan from Colby College Museum of Art. It’s not surprising, then, that artists associated with illustration, such as Frederic Remington and, later, Andrew Wyeth, who wished to transcend their hard-won popularity and earn approval from critics, often turned to images of the night. Remington is represented by two paintings: “Shotgun Hospitality,” a campfire scene featuring two Native Americans, a cowboy, and a mysterious figure in silhouette (possibly a ghost), and “Moonlight, Wolf,” a great painting of a standing wolf turning to meet our gaze. Addison Gallery of American Art, Phillips Academy. 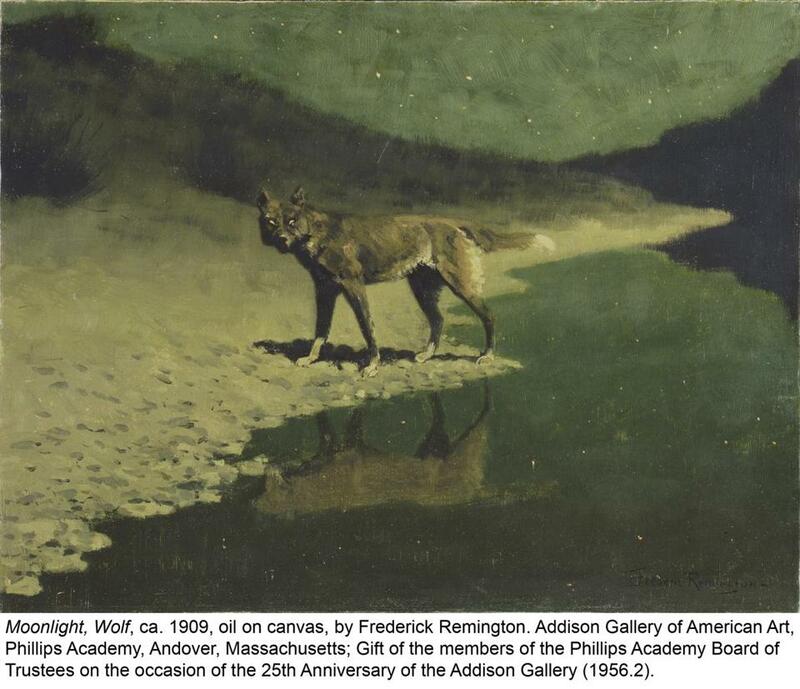 Frederic Remington’s “Moonlight, Wolf,” circa 1909. You perceive this reverence, and an order of events at odds with workaday realism, in the paintings of Albert Pinkham Ryder and Ralph Albert Blakelock. Both artists loved the night — and also the moon. Both made the most of the visual indeterminacy of the night to pursue a kind of “inward vision,” eschewing external reality in favor of inner states. Blakelock suffered from schizophrenia and was institutionalized, which only enhanced his reputation as a suffering, visionary genius and thence the popularity of his works. So here, combined and under the cloak of night, as it were, we already have many of the ingredients we associate with modern art: the turn inward toward subjective and often tormented states of mind, an interest in evoking what is not actually visible, and the drive toward abstraction. The exhibitionat Bowdon investigates the implications — psychological, emotional, spiritual, social, aesthetic — of night vision in American art, in a period that saw artificial lighting rapidly encroach upon the human experience of night. But this show also addresses another important strain of modernism: artists’ abiding interest in the objective conditions of modernity — above all, in the life of the city at night. The show includes dozens of prints, paintings, and photographs of urban activities illuminated by artificial light, from bars and boxing matches to circuses and window-shopping. Electric lights don’t illuminate everything. They create deep, and often disturbing shadows. And so it’s not by accident that many of the show’s ostensibly realist images have an ominous undertow. For me, the most exciting discovery in this vein are the drypoint etchings of Martin Lewis. Born and raised in Australia, Lewis moved to the United States when he was 19 and became a brilliant printmaker. 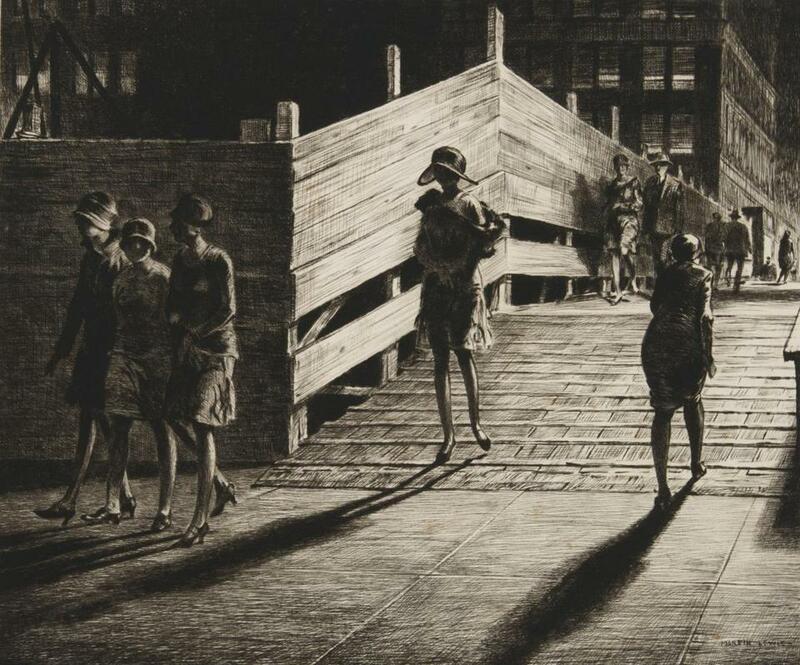 His “Fifth Avenue Bridge,” 1928, uses street lights, shadows, and deep perspective to create an unforgettable image of New York pedestrians, most of them women, at night. Lewis met Edward Hopper — after Whistler, perhaps the American artist most commonly associated with the night — in 1915 and encouraged him to take up printmaking. A comparison of etchings, one by Lewis, one by Hopper, of city street corners seen from above demonstrates Lewis’s prodigious skills, but also Hopper’s genius for distillation. Where Lewis includes many realistic details, Hopper arrives at something more haunted and universal by omitting everything unnecessary. Martin Lewis’s “Fifth Avenue Bridge” from 1928. Hopper’s penchant for voyeurism — another prerogative of night vision in the city — is a dominant theme in this part of the show. It stretches from intimate scenes observed through windows by John Sloan in the first decade of the 20th century to a captivating three-channel video of similar scenes a century later by French-born Brooklyn, N.Y., resident Michel Auder. With works by Arthur Dove, Lyonel Feininger, Marsden Hartley, Marguerite Zorach, and Joseph Cornell, the final part of the show makes explicit links between night visions, symbolism, and abstraction. The three most arresting abstractions are all by women. One is a monochrome painting, “Assault on the Solar Plexus” made by Lee Krasner in 1961 when, five years after the death of her husband, Jackson Pollock, she dealt with persistent insomnia by painting at night. The second is an early assemblage, painted black, by Louise Nevelson. She denied the material aspects of her work: “I don’t make sculpture, and it isn’t black and it isn’t wood or anything because I wanted something else, I wanted an essence.” Nevelson originally wanted to display her breakthrough 1958 show in a completely dark gallery. She relented and instead installed a single bulb, by which she wanted to evoke moonlight. The third, “Black Abstraction,” by O’Keeffe, shows a cropped circular form divided by a crooked white line. It’s the most arresting painting by O’Keeffe I’ve ever seen, and it’s a highlight of this mood- and mind-altering show. At: Bowdoin College Museum of Art, Brunswick, Maine.